Thursday morning was warmer than the previous days and the sky was cloudy. Steve convinced a few of his New Era Gems staff to join the Sentinel Peak walk. Ryan brought his drone and demonstrated its capabilities when we reached the base of the “A”. It was tiny and he put it though maneuvers that were like a mechanical hummingbird. Then he showed some of the other features which were equally impressive. In the back row of the ballroom, I found the UltraTec booth. Robert Mendoza was there showing the machines and I had the opportunity to ask a couple questions about my fantasy machine as well as show him some samples of I had accomplished with the Fantasy machine in the past few months. Then down to the main hall. Like the AGTA show there, it was huge and the items in the vendor cases were upscale. There was very little in the lower end of the mineral, gem, etc. market that one typically finds at a club show. Towards the center of the room were the displays from club members. Also there were exhibits from the Smithsonian, the GIA and similar institutions. This was definitely not your average club show! It seemed that the front side of the room had gems and jewelry vendors. Towards the other side were the mineral vendors. Quite a few of them were in tall display cabinets and one could easily feel you were looking at a museum exhibit. Of course the prices for those pieces were not for the faint of heart and light of wallet. Three zeros before the decimal point was not unusual where prices were actually shown. As afternoon progressed dark clouds got darker and by evening we were having some rain showers. Friday was the last day of the adventure. The morning started with additional rain showers. These eventually went away and blue skies eventually broke through for a short time midday. It was time to sort through things, make sure the suitcases would hold everything for the return trip, and take one last trip around the area. The official time for the Pueblo show was over and most of the vendors there were packing up. Quite a few vendors in some of the other freeway shows were also closed that day. 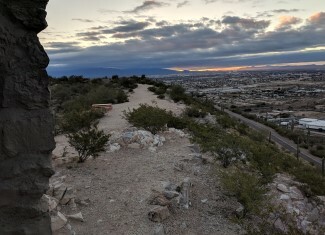 The morning walk included a dirt and gravel path to a lookout spot. On the way back to the paved road my attention was not on the ground and I tripped on one of the rocks that were randomly sticking above the path surface. Given a fall last year resulted in a broken wrist, it caused a moment’s panic for my companions on the walk. Fortunately this was a much different situation and I ended up with only a few scrapes and bruises from the rocks. Now that the basic scouting had been done, the pace could be a lot slower. I headed off to the Hotel Tucson to pick though the bags of old rough John Garsow had to sell. Even after it had been picked over by others for a week, there still was a lot of interesting items there. Of course, a lot of them were for much bigger budgets than mine. Eventually I found an assortment of items that worked. In my initial visit to the Hotel Tucson, right off the hotel lobby I noticed a display for DVD sets of the PBS show “The Mineral Explorers”. I got email approval from the SLO Gem & Mineral Club board for purchasing the DVDs. So the two season set will be available for the club for future programs and as a library item for members who want to binge the series. 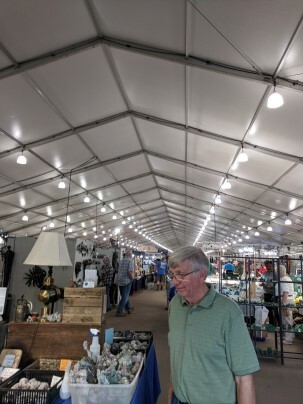 During the afternoon, I had time to walk through the tents at the Red Lion Inn as well as browse the vendors at the other hotels along the freeway strip. It was an early return to the hotel followed by dinner and some shopping at a local big box mall. The highlight of the morning walk came as we got towards the end. Some movement in the brush below us turned out to be a herd of deer. As we walked further down the road, we could see the deer one by one crossing to the other side at a spot just beyond a curve in the road. We arrived at the curve and another deer was visible in the brush beside the road. We waited a few seconds and it came out of the brush. Then the deer went to the middle of the road where it stopped, turned to look directly at us and paused for its photo op before calmly crossing the rest of the way. It was off to New Era’s rooms at the Pueblo show for the day’s rough shopping. Having checked out the material they had on display, I had a pretty well defined shopping list. Before I headed over there, I had estimated how many pieces, sizes and weight I expected to get. I have been trying to get better at recognizing the size/weight of rough on sight. I found that I often underestimate sizes and pick pieces that are larger than what I wanted and my budget allowed. At least for the first few items, my purchases were right on target. While I was at the New Era rooms, Rej Poirier of GemCutStudio fame came by and we talked a bit about how concave faceting was done. One of the many challenges Reg is thinking of taking on for future updates to his software would be to include the impact of concave facets. That evening, New Era Gems held a party. Good food and good, friendly people. The temperature Wednesday morning was a bit warmer, so for a change, I didn’t have to scrape the frost off the car windows. It was still cool enough that my hands were cold. I need to get some light gloves to bring next year. I headed to the other side of the freeway that morning to the 22nd street show to take a second look at the facet rough I had seen a few days earlier and make sure I had not missed something. It was a lot quieter than it had been on the weekend. At one of the sunstone booths, the mine owner answered some questions I had about the material. Since I admitted to previously faceting only one sunstone he gave me additional tips for faceting his material. I came away with a couple pieces of practice clear rough and one with a red color center. After a couple more hours of wandering around the various freeway shows, I headed back to the hotel to rest my feet. The morning got off to an unintentional late start. The volume on the cell phone had accidentally been lowered to almost silent. When the alarm went off to get me up in time to make it for the morning hike around Sentinel Peak, I slept on. I decided that it would be a good day to scout the 22nd Street show and the JGM show on the other side of the freeway from the hotel. 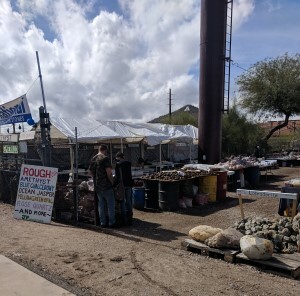 There were a number of vendors in the 22nd St. tents that claimed to be offering facet rough. Most of what I found was not of the quality I would consider cutting or else were too tiny for most US cutters to consider. 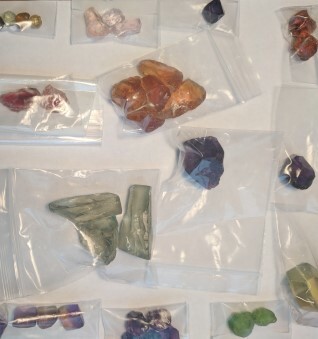 I did find several vendors offering sunstone rough of various types, sizes and prices. With those and the few others having rough that might work, I took notes on what I discovered. The notes also included the location of the booth within the 22nd Street show so I could find it again. The show is that large! The JGM tent a couple blocks north was fairly small, had some vacant spaces and nothing to attract me for a later return. There was a shuttle stop right outside the JGM entry and shortly I was on my way to the Arizona Mineral and Fossil Show being held at the Hotel Tucson City Center. That show is where John Garsow shows his gems, minerals and facet rough. I had a nice catch up conversation with John and got an idea of the rough he was selling. As I left, he mentioned that he had old stock materials from several estates that I might want to check out on my planned return there. I did not see much else in the way of facet rough elsewhere at the Hotel Tucson. There was plenty there for fossil and mineral collectors. I took the shuttle back to the freeway shows area and headed back to the GJX to get a few of those Mali garnets I had seen the previous day. They were an interesting yellowish green shade, not very large and within my price range. I found the booth and picked out a few to take home. Hopefully they will be quick and easy cutting to balance out the large quartz gems I have planned to cut with the fantasy machine. The Pueblo show was on the way back to the hotel. 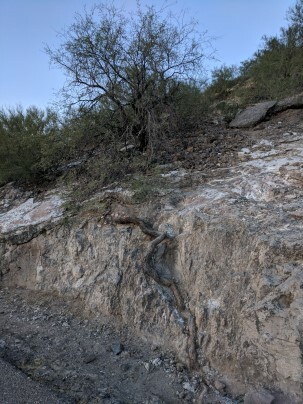 There I stopped to get some Arizona peridot rough I had seen the previous day. Saturday evening was the USFG social, the “Hob Nob” at the OPLC. Dinner was pizza, chips, cookies, sodas. The “pretty stone” competition was held with separate voting for natural and synthetic stones. Several people arrived with facet rough for sale, including Farooq Hashimi whose Tucson trip got off to an awful start by having his van broken into and a backpack containing rough stolen while he was having a lunch break in Atlanta. I came away with a handful (literally) of amethyst rough that Farooq had among his offerings. It was a good evening with lots of show and tell among the attendees, sharing of problems and solutions, and generally getting to know other faceters. There was no glitch with the cell phone alarm so the day started with another chilly hike. 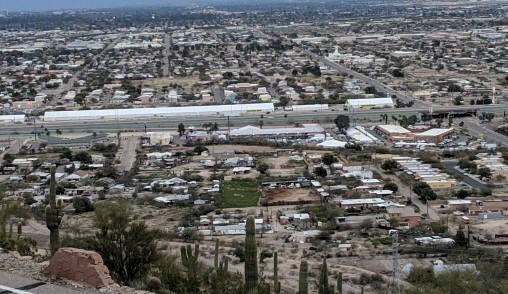 From Sentinel Peak, many of the tents for the freeway shows can been seen and the scale of the shows appreciated. 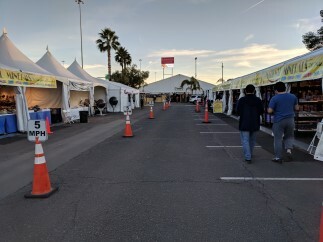 This was the last day for several of the wholesale / trade only shows so the plan was to check out the G&LW Holidome and Gem Mall shows as well as JOGS. I got to the Holidome parking early enough that I got a space directly out from the entrance. The large gravel surface had settled in from last year and it was much easier to walk in the parking lot. The golf cart parking lot shuttles were out in force and getting new arrivals to the front entrance in record time. The G&LW shows were pretty much as I remembered – lots and lots of beads, findings, finished jewelry, cabs and some commercial cut loose stones. I had a few vendors to check out for possible rough or stones that could be recut. Those and some others which did not have the right keywords in their listing did not have anything that interested me. JOGS was also much like I remembered. The parking situation was confusing and the floorplan is equally bad. But instead of being a rectangular layout, the floorplan was a cross with doors at each of the four ends. It was easy to get turned around and likewise easy to not notice which direction was the one leading to where one parked. The promoter grouped vendors of similar items so there was an amber area, and a silver jewelry area and a loose stones area, and so forth. As I was wandering around the loose stones section, I came upon a case which had what were obviously well cut Montana sapphires. It turned out to be a booth run by a fellow USFG member and we had a nice chat. After JOGS I headed over to the KINO site in hopes that the Graves listing there might actually turn out to be a vendor with dops in the sizes I wanted. But no joy. The spot identified in the show program book was occupied by someone selling finished stones and jewelry. Since I was there, I wandered around many of the tents. I found one lapidary supplier who might be a good resource for the future. He had several items I was wanting and others that I might need in the future. Hopefully he will be at the CFMS show in Pomona next month as fitting more into my suitcase was not an option. 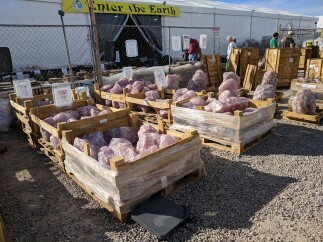 Kino is not the place to find gem facet rough, but if you need a pallet of boulder sized rose quartz or equipment for cutting that size material, then Kino is your show. 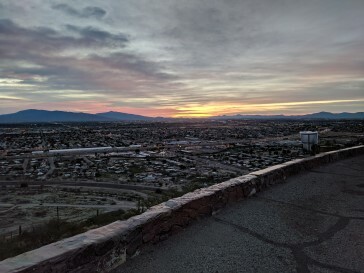 After another brisk sunrise walk around Sentinel Peak and the breakfast offerings at the hotel, it was off to the Tucson Convention center (a one mile walk from the hotel) for an 8:30 session with AGTA about their Spectrum Awards competition. I had never really read the competition rules – by the time my faceting was getting to the level where I might start considering it, life had me heading off in another direction. Recently I heard that there had been some issues with how the competition was being handled that upset many of the US gem cutters and jewelry designers. I was curious to learn what the situation really was. From what I could see of past award winners, it did seem like the one with the deepest pockets was likely to be the winner in certain categories. For instance, excellence of cutting did not seem to be obvious in the classic stone category (emerald, ruby, sapphire). There was a good dialog during the session. The AGTA staff listened to the complaints and seemed to be willing to address a couple of items. For instance, when a piece of jewelry was the result of a collaboration effort, the existing rules allowed for only one name to be placed on the entry. With respect to other issues, the AGTA told the attendees to come up with specific proposals for consideration. They cautioned that they could not expand the competition to add a lot of additional categories. Overall, a good hour for me coming away with a much better understanding of what goes on for a piece to win a Spectrum Award. Plus I got to meet some nice people who are among those who had won the Spectrum. Then it was out to the show floor where there was booth after booth showing sapphires, emeralds, jewelry and other gemstones of all types. I was thrilled to meet Michael Dyber at his booth and find him so willing to share his experience. Several of his gemstone carvings were quartz with large flat beautifully polished surfaces. I asked how he managed to accomplish that as I have, like many other faceters, found that quartz can be troublesome. He explained, not only that he did all his “faceting” by hand holding the stones, but he described the tools he made and used for the process. It wasn’t too long before another seminar of interest was scheduled. During the USFG talks there was mention of a colored stone pricing guide that a couple of the pros found useful. The company that creates that guide had a seminar explaining the various grading categories and how they interacted to come up with a grade for use with the pricing guide. Their view of grading diverged from what my old GIA course had offered, but basically was closer to what I believed useful. The bad news was that their guide is not inexpensive and it sounded as if it required purchase of an equally pricey color guide in order to make use of the subscription. Next, back on the show floor to continue exploring the exhibits. Last year I bought a two pieces of sunstone rough there. The mine owner was quite friendly and gave out a GIA produced DVD about his operation. 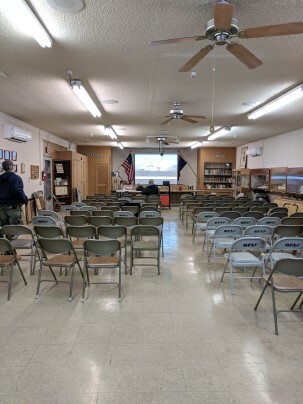 In the past year, we used that DVD as a program for the San Luis Obispo Gem and Mineral Club and it was a big hit with those in attendance. I stopped by the booth to let him know how much the movie was enjoyed. Also, I wanted to get his opinion on the one sunstone I had gotten around to cutting to be sure that I was on the right track for faceting those gems. Then my schedule directed me to head across the street to the GJX tent. There the aisles were narrower and seemed more crowded. As I cruised along the first row of booths, I was surprised to see some folks there I did not expect to see until the TGMS the following week. After a brief catch up conversation, I got back to walking up and down the aisles. Eventually I reached the Brazilian vendor who had the nicest prasiolite last year. And there was plenty more this year. I came away with a few large pieces. These will get sawn into more manageable sizes and be perfect to use over the next few months as I learn to use some of the more advanced features of the Ultra Tec Fantasy machine I recently acquired. At that point there was still at least have of the show to check out. In that second half I found an African rough vendor that I remember from last year having reasonable pricing and decent looking materials. I was planning to purchase something from them then, but the broken wrist issue got in the way and I did not have the energy to find their booth in the large hall. Their materials this year were similar, so I made some notes and got an idea of pricing before finishing my GJX scouting expedition. 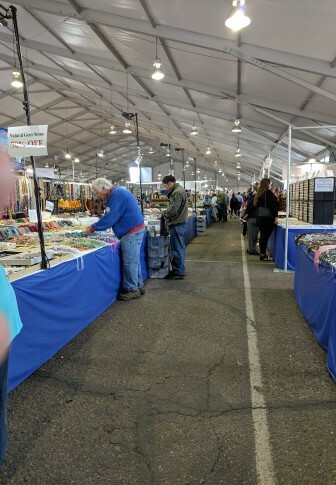 I finished up the GJX a little ahead of my schedule so I was able to swing by the Pueblo show on the way back to the hotel and get some ideas of rough there and pricing. Somehow the year has flown by despite best intentions of posting more frequently. All of a sudden it was time again for Tucson. We arrived at our hotel over an hour later than planned as a result of the Phoenix to Tucson flight delayed due to weather elsewhere. The room we got this year was not nearly as nice as the one last year. One of the bedside lights was missing the lightbulb, the microwave was missing the turntable, the heater was falling out of the wall, a non-slip pad had been applied in the tub in a sloppy way, etc. (The staff took care of the first two items the next morning.) Basically the room needs a complete update. We headed off to a very late dinner at the Kettle, the diner located next to the hotel. There, overhearing us talking about the gem shows, a young man from Mali came over to talk to us. And of course he had some gem material to show us that he was hoping to sell. Tucson is like that. Next morning I got up early to meet Steve Ulatowski for the sunrise walk around Sentinel Peak. It was very cold - at least to my moderate climate sensibilities. The car windows were coated with frost. It had been many years since I had to scrape the windows and the rental car did not come with a scraper. I managed to clear just enough to see out using the plastic room “key” and made it to the meet up point in time. The sky was clear, there was a bit of a breeze and more than enough to get one wide awake. After the walk it was back to the hotel for a hot shower to thaw out and have breakfast. Then I was off to the Old Pueblo Lapidary Club building for the US Faceters Guild talks. The first presentation was by Dan Lynch and Peter Toracca on faceting as a business. They shared their experiences, good and bad, and provided tips on tools, resources and other topics that would be valuable to an individual who is moving from hobby to professional level faceting. Peter and Dan had been to Africa recently to help teach the miners in Malawi about the gem trade, gemology and geology. Malawi is one of the poorest places in Africa, but the gem resources there may be a key to improving life there. They had also been involved for some years in the building of a library for the local children. It was close to completion now and Dan Lynch had several parcels of Malawi garnets available for purchase. All the money from the sale of the parcels was going to finish the library. That was a no-brainer for me -- and my first Tucson 2019 purchase was done. I had expected to spend the entire day at OPLC, but the second presentation of the day was cancelled. I headed back to our hotel which was by the I10 freeway. There was just enough time to get my badges for the AGTA and GJX shows and take a quick peak. AGTA had white carpeting in the ballroom where the Spectrum Award winners were being displayed. I felt guilty walking in there with shoes that had not very long before had to walk through the muddy parking next to the hotel. 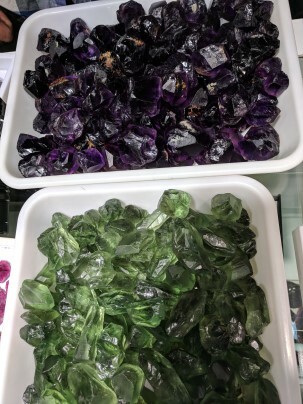 At GJX, I located a vendor who had the great prasiolite the previous year and then went by John Dyer’s booth to check out his fantasy cut stones. As usual, he had a couple spectacular gems. One large morganite square cushion stone looked like fireworks went off in the stone. Then it was time to go back to the OPLC for a presentation on recutting by Boyd Fox. Boyd has been doing a lot of recutting and repair work on expensive gems. He described his approach to reviving a gem and finding the right angle for a particular facet. The thing that he could not really explain was how he is able to dop the stone so accurately and do it multiple times in a complicated job since he removes stones to check progress. I think most of us in the audience were awed by that part. The best explanation offered by someone in the room was that it gets easier after about 500 stones. After that talk, I made a brief stop at the hotel to refresh before heading out to the GemologyOnline.com dinner meet up. There was a mix up with respect to the reservations for the group, but the restaurant managed to find space despite it being very busy. A great group showed up for a couple hours of good food and lots of stories. As last year, it was great to get to know the faces behind the screen names. And this year, since it was my second time, I got to renew a few acquaintances as well. Some present had already been to several of the shows and had interesting finds to show off. There was an amazing amount of knowledge about gemology and related subjects in that group. The evening ended way too soon! The day started with another hike up Sentinel Peak. I was starting to know the route and do better with my pace. While I am not a big fan of cactus and succulents, I was finding the local flora’s ability to survive on such a rocky place impressive. Next it was off to the JCK show (http://tucson.jckonline.com/). It wasn’t a very large show and was primarily finished jewelry vendors. There was one vendor who indicated that they had peridot both finished goods and rough material, so I headed for that booth. They did have rough, but it was one of the few negative interactions I had with vendors during the entire trip. It was difficult to get one of the people working the booth to come talk with me. And then I think a bit more confusion to get someone who knew about the rough material. The peridot was Chinese – more yellowish than material from Arizona or Pakistan. And while the pieces in the tray seemed to be a nice size, they exterior was cloudy and the stones were dry. So it was hard to tell at a quick glance how clean the material was. Then came the price - $43 per gram with a minimum of a kilo purchase. I had already seen some retail pricing for nice colored, clean Pakistani peridot that was better and allowed picking. Unless those rough stones were a lot bigger and cleaner than they looked, they would probably be returning to China to be cut. Or was I supposed to have tried haggling for 100 gm and half the price? I wandered through the rest of the displays. It was not very crowded. Actually it would be better stated that there were not many people there. Most of the jewelry seemed to be on the lines of big, bulky rings or else the other extreme like a small dangle on a chain necklace. In that respect, it was in keeping with what I had been seeing at AGTA and GJX. Since it was still early, I headed off to the G&LW shows (https://www.glwshows.com/). When I had last been to Tucson, G&LW had two separate locations. Now it was all in one place. And the place was humongous. I think the spot in the parking area I found was a quarter mile from the entrance to the show. They were running golf carts to get people back and forth, but my timing was bad. Normally the walk would not bother me. However in this case, the parking area appeared to have been recently refreshed with gravel. Or maybe it was baby boulders. Most seemed too big to have passed through a one inch screen. It was a difficult surface and required attention in some spots to keep from turning an ankle. Unlike the JCK, the G&LW show was very busy. The vendors there were closer to those who participate in the InterGem or Gem Faire shows that are scheduled in various cities around the country. There were lots and lots of beads for sale. Also there was a lot of lower end findings, inexpensive finished jewelry and similar goods. A couple of large vendors had special areas at the end of buildings for essentially their own “store” within the show. One thing I noted in the G&LW spaces that I had not seen elsewhere was a fair amount of turquoise and Native American jewelry. It was not a good hunting ground for facet rough. Next stop was JOGS (https://jogsshow.com). Parking was a bit harder to find at this site, but it was a lot easier trip to the show entrance. Based on the description of the show I was hoping to see higher quality goods than at G&LW and hopefully vendors with facet rough. First impression on entering was “where am I”. The floorplan at JOGS deviates from the typical grid used by most shows. It seemed to have more in common with a casino where the object is to keep you from leaving. At some point I found one of the other entrances and located a stack of show guides near the door and used that as a guide to navigating the place. Even then I got turned around several times. I did see a little rough material, but nothing that was close to what I would want to buy. Most of the goods were about the same quality as at G&LW. Since I was making better time through the shows than I had expected, I decided to head to the Kino site (http://www.as-shows.com/) in hopes of getting additional dops from the Graves vendor who was supposed to be there. From the freeway I had seen the complex had multiple tents and was not clear how it was organized. After arriving, it was even more of a puzzle. “Random” is probably the best description of the layout. Kino was a totally different sort of show. Much of the material being offered there was like that in the GIGM show at our hotel – only in much bigger sizes and much larger quantities. This was the place to go if you wanted a slab of something for a table or countertop or if you wanted a chunk of rock for making a sculpture. There were several equipment vendors there who were providing the tools scaled for the bigger tasks. These were much more industrial strength sized than those typically used by rockhounds, crafters and jewelry artists. I wandered well into the tent city before I found their stack of show guides and was able to locate Graves. No joy when I got there. The only dops they had for sale were a complete assortment set. It was just as well as I discovered that I had left my phone containing my shopping list back in the car. Obviously that was a signal to call it a day and head back to the hotel. 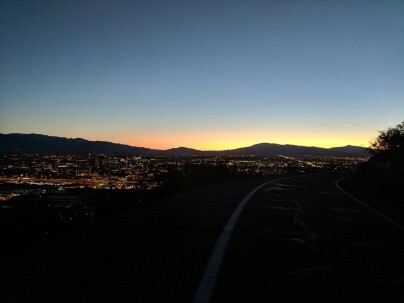 Again I started the day doing the hike up Sentinel Peak for the sunrise. There were a few more people out then on the previous day, but mostly quiet. A small cottontail rabbit appeared along the way up. Until it moved it was just a lumpy shadow on the side of the road. I had to keep things moving that morning as I wanted to attend a presentation on “A Brief History of Colored Stone Faceting” at 9am at the AGTA site. As there was not a good chance of a shuttle at that hour, it meant another mile walk from the hotel to the Convention center. That was fairly easy compared to the earlier one since it was all level ground. The presenter, Justin Prim, was someone I had met briefly at a faceting event a couple years ago. At that time he was planning to go abroad to complete his gemological studies and see the world on a budget that beat out studying in the US. Since then, I had seen him posting on faceting related sites. My curiosity to see how his adventures had progressed made this a not to be missed seminar. 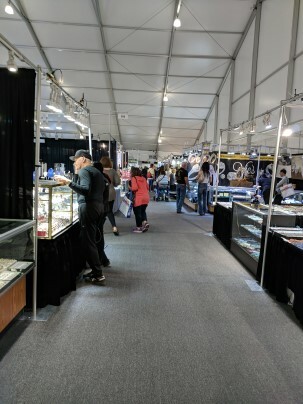 Then it was on to a shuttle to get to the Hotel Tucson Center City to check out the Arizona Mineral and Fossil Show (https://www.mzexpos.com/) where John Garsow, another rough dealer I had known for many years, was showing. There were a few tents and outside vendors here, but most were in the hotel rooms. Unlike the other hotels with shows, this one still had some lawn space uncovered and scattered around the lawn area were an assortment of dinosaur models. After I checked on what John had of interest, I headed back to the shuttle stop. Normally one should be by every 20 to 30 minutes or better. It was at least 40 minutes before the right one finally appeared. 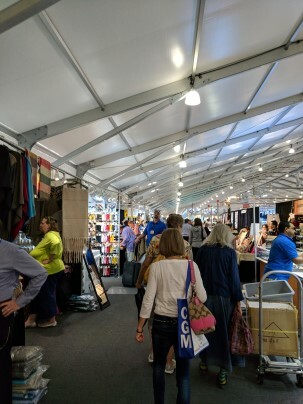 There was one more show in the area on my list to explore – JG&M Expo (http://jgmexpo.com/) which was basically between the Convention center / AGTA and 22nd Street show. So that was where I headed when the shuttle returned to the Convention center stop. It was a lot like 22nd Street in being open to the public and a mix of all sorts of related goods. I found some facet rough there and then went back to 22nd street to follow up on a lead from one of the GO meetup people on peridot rough as well as having a late lunch in the food court there. At that point I was done and headed back to the hotel to make notes on what I would buy the next two days and rest up for the USFG “Hob Nob” social event that night. I had just crossed the street at the corner by the hotel and then it happened. I tripped on the pavement and between too much forward momentum and the weight of the backpack, I went down. As I started to get up, I knew it wasn’t just a few bumps and scrapes. My right wrist was at a not good angle and I had a bad feeling, was broken. I think I was more upset by how this event was going to impact my plans for the remainder of the trip than I was bothered by any pain from the injury. (It hurt when I tried to use the hand, so short term solution was to avoid its use.) The hotel desk clerk told me that the closest ER was at Saint Mary’s Hospital and then Google maps showed that was two and a half miles away. That was definitely further than I wanted to walk. Just outside the hotel door I found a taxi cab waiting for business and shortly was delivered to the ER entrance of St. Mary’s. I was shocked to find the waiting room had only a couple people there. It was a matter of minutes before someone called my name and took me inside. A while later X-rays confirmed my initial diagnosis – I had fractured my wrist. I would need to seek care from an orthopedic specialist when I got home to deal with it. Until then, they put it in a splint and then gave me a sling to hold it. I left with a prescription for some meds to help with swelling and pain, a disc with the x-rays and a packet of paperwork from the event. So we actually made it to the Hob Nob. A bit late, but they hadn’t run out of pizza or soft drinks, so it was okay. The speaker for the evening had just started. I had pretty much forgotten about that. As things turned out, the topic “The Evolution of Diamond Cutting” complimented the seminar I had attended that morning on colored stone faceting. After the speaker I had a chance to meet and talk with additional folks in the USFG community. I was glad that I had the chance given the circumstances. The broken wrist arm in a sling and not able to grasp anything with my right hand simplified some of my shopping options. I was not going to be examining rough with a loupe. Nor would I be buying anything using checks. There were a couple of vendors where I might pay cash for goods that were clear enough to see as eye clean. For the other items I would go to my long time rough dealers who I could trust to have really clean material and help evaluate my picks if needed. I suspect I might have spent more had I not come up lame. I was moving a lot slower and with an excess of caution as I took the shuttle or walked between venues. People for the most part were nice and were willing to help when needed. At one shuttle stop I was approached by a young man whose badge indicated he was from Pakistan. He inquired how I was doing – apparently he was among those who witnessed my fall the previous day. I wish I could have stayed for New Era’s Super Bowl party at the Pueblo show, but I could feel my energy resources were about to zero. I got back to the hotel and watched the last part of the game from a warm bed. My family back in the Philadelphia area were all very happy that night seeing their Eagles team win. The last full day in Tucson was supposed to be for packing and checking out places that did not fit into the more planned days. By the time I got the preliminary packing done with just one hand, I was pretty much done for the day. Decided to rest up for the trip home the next day. For day two, the alarm was set for 6am and I was able to grab breakfast downstairs before heading out. This time I found my way without any mistakes. It was much quieter and very few people were out for a normal morning. The moon was still close to full and bright as I started up the road. It was also not as cold as it had been the previous day. I stopped at various spots along the way to take photos of the view. 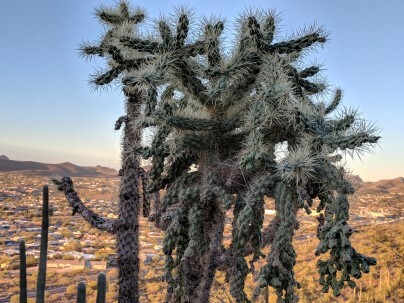 And as I was on the downhill part of the walk, it finally clicked that the surroundings were not some botanical garden, but that the cactus and other desert plants were local natives. The plan for the day was to go through two of the wholesale only shows. The first was the AGTA show (http://www.agta.org/tradeshows/gemfair-tucson.html) being held in the convention center. I had pre-registered for these online, so it did not take too long to get my badge and be able to start wandering around. I first went into the tech hall. Cad software for custom jewelry design and 3D printers were a significant proportion of the booths. I watched for a few minutes as one CAD vendor was demonstrating how his product would work and marveled at how far things have come since I started out programming with punch cards in the mainframe days. A few minutes later around the corner I heard someone say “Morro Bay”. The nearby booth for a safe jewelry cleaner product belonged to a local firm. (http://www.lavishjewelrycleaner.com/) We chatted briefly, and then I headed off to the main hall. This was yet another large venue with aisle after aisle of vendor displaying mostly high end goods. There were so many different vendors with GIA certificated sapphires I don’t know how someone who was shopping for such an item to get started. Plus there was lots of sapphire not displaying papers in addition to many emerald and pearl booths. 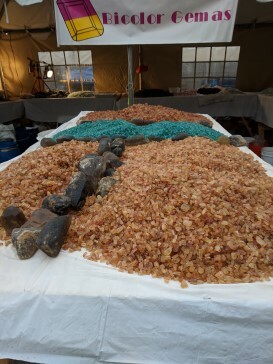 And of course there were many dealers with other colored stones ranging from packets of dust size melee to large specimens that would be hard to use in jewelry due to size. I noticed that quite a few of these vendors included something in their booths that I had not expected - large heavy duty safes. I assume that was to provide an extra layer of security for the hours where the show was closed. Meanwhile, as I walked the show aisles, I learned to stay a distance from the show cases. When I walked closer to get a better look at all the shiny objects, it was too easy to put my hand on the edge of the cases – and be rewarded was a shock. This was another effect of the dry Arizona air. I had to feel sorry for some of the sales people who did not have the option of staying away from the cases. At one end of the room, the Spectrum award winners for this year were on display. While there was some impressive design and craftsmanship displayed as well as killer gems, I did not see much in the bunch for regular folks to wear. I had to laugh at a couple of items that were categorized as “business / daywear”. No clue what sort of business would be compatible with that amount of bling. I was somewhat disappointed that there were not more designer booths at AGTA. My recollection from long ago was of getting to see in person work by well-known designers. Perhaps it is just a style thing and what was being shown did not fit my concepts for design. I made my first purchase of the trip there – two pieces of rough facet grade Oregon Sunstone. The gentleman who assisted me was quite helpful. 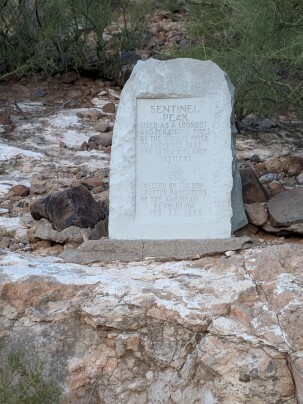 It turned out that he was president of the mining company (http://www.desertsungems.com/). He also gave me a DVD made by GIA about their mining operations which may work out nicely as a program for our local gem and mineral club. It was mid-afternoon by the time I left AGTA and headed across the street to the GJX show (http://www.gjxusa.com/). Yet another huge venue! Since I had my AGTA badge on, getting the one for GJX was very quick – they just put a sticker on the AGTA badge. I could have skipped the annoyance of pre-registering. There was one vendor there who had posted on the faceting yahoo group list that he would have all sorts of facet rough. There was a small sign on the booth counter to ask about facet rough. What was pulled out was far from what was advertised. Very little material and even less variety. 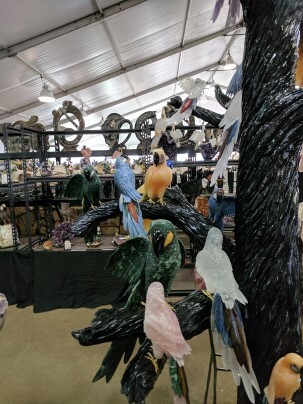 So with that option scratched off the list, I explored the booths and found several other vendors with quantities of interesting rough and a few that even were affordably priced. I found that the floorplan for GJX was hazardous – little ramps covering the electrical distribution were placed frequently across the aisles. Although they were marked with a bright color, in that sort of environment my eyes were held by the glitter in the booths and I tripped on them several times before I changed from walking the aisles along the front of the booths to using the ones that were perpendicular between booths. I reached the far end of the hall and started heading back to the entry thinking I had seen all there was to see there. Only instead of the exit, I found there was another room. And after that, another one. Fortunately, those were much smaller spaces and eventually I made my way out. The evening plans were for a dinner meet up with others who were members of the Gemology Online forum (https://www.gemologyonline.com/Forum/phpBB2/viewtopic.php?f=95). While I have not been particularly active in posting, I follow the colored stones lapidary post and have gotten a lot of good information from that group as I have gotten back into faceting after many years away. I was looking forward to meeting some of the people behind the online posts. In fact, meeting others who are involved with gems and jewelry was the top of my goals for Tucson. Buying facet rough was a vague second. I was not disappointed by the event. Everyone was friendly. Some there had been friends for years. Others like me were newcomers to the group. I only wish I could have gotten around the room more to meet a few more of those attending. A few of those I got to speak with included Barbara Voltaire, Julie Kerlin, Justin Prim, Lisa Elser, Arya Akhaven and Stephen Challener. 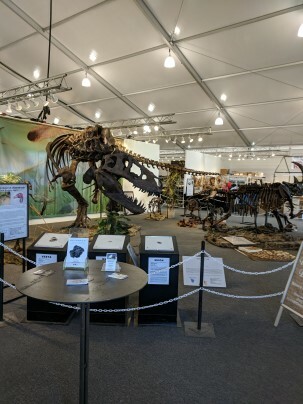 For over two weeks every year starting in late January, Tucson, Arizona becomes the site for gem, mineral and fossil shows. People from all over the world flock there to buy and sell, get updated on the latest trends, attend trade group conferences, meet up with old friends and make new ones. 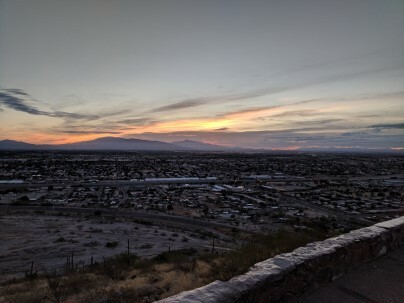 I had been to Tucson three times previously, but the most recent time was twenty six years ago. In that time the number of vendors has increased significantly and the count of venues is now somewhere around four dozen. So I was quite excited to be going again in 2018. We arrived late the previous evening after a fairly uneventful trip. Well, it was unusual in that both flights actually landed not just on time, but early. The rental car was ready and we found the hotel without a single wrong turn. It turned out that the hotel was one of the show sites, so there was only a narrow path through to the lobby desk. Despite the apparent chaos from the show, the accommodations were okay. I was concerned that it might be noisy, but as we discovered, around 9 pm quiet seemed to settle in for the night. The alarm went off at 5am. 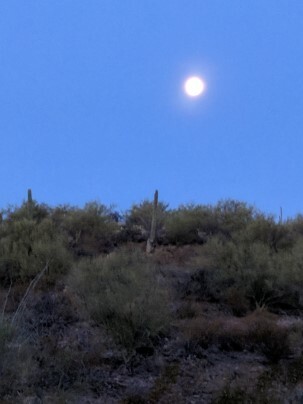 Steve Ulatowski, New Era Gems, had posted about the lunar eclipse, super blue moon and had challenged friends to meet at the base of Sentinel Peak to walk up to the top for the eclipse followed by the sunrise shortly thereafter. After what seemed like several minutes as the alarm sounds from the phone grew increasingly louder, I finally managed to silence the beast and crawl out of bed. It was definitely on the cooler side of things as I exited the back door of the hotel and headed for the neighboring dirt lot where the car was parked. (Normal hotel parking was filled with outdoor show booths.) Sentinel Peak was basically behind our hotel, so getting there was just a matter of following the streets heading that way. Well, sort of. Took a few tries to get on the right road and then one stop along the way to check google to be sure I wasn’t on another dead end. I was surprised to see how many other people were crazy enough to be up and about at that hour. 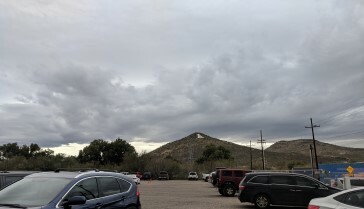 There were a few dozen people in and around the parking lot at the base of the peak watching the show. The moon actually was taking on a reddish cast as advertised. About the time there was only a tiny portion left not impacted by the eclipse and Sentinel Peak started to obscure the view, the New Era contingent arrived on the scene and we started the walk up the peak. After only a very short distance we gained enough elevation to have a good view of the moon again. It was pretty dark so I could not identify most of my companions for the hike. One gentleman introduced himself as “Arnold”. (Later that night when some posts of the event appeared on Facebook, I discovered that he was Arnold Duke, President of International Gem & Jewelry.) We went to a lookout spot at the top to watch the full eclipse. It was quite breezy and cold as might be expected but the view was fantastic. As the event passed we headed down and around to the other side of the peak to watch the sunrise from a spot just below the “A” on the hillside. After getting back to the hotel and thawing out in a hot shower and a bit of breakfast downstairs it was time to set off exploring the shows. Our hotel and the one adjacent were both sites for the GIGM shows (http://www.gigmshow.com/). The vendors were just uncovering their outside booths as we set out. The amount of material to see was mind boggling. Some booths had mineral specimens including amethyst geodes up to six feet tall. Others had equally impressive fossils. There were some larger tents where one could find cabochons of just about any material you could imagine. Most of the ground floor rooms were being used by vendors and just about every possible square foot of outside space around the hotels was covered with booths. Eventually we decided to head up the street a bit to the next site where the Pueblo show (http://www.pueblogemshow.com/) was hosted. Years ago that hotel was named the Pueblo Inn. It is now called the Arizona Riverpark Inn, but the original name for the gem show located there has stuck. I had some recollection of that show from my past visits since Room 110 has been home to New Era Gems (https://neweragems.com/), one of rough dealers with whom I have done business since I started faceting. It was quite apparent that the size of the show had increased dramatically. We entered via a huge tent containing a huge selection of fossils, minerals, carvings and many other related objects. Again, some of these items were quite big. As we exited and headed towards the front door of the hotel, we encountered a couple additional specimens of quartz crystals that dwarfed all the others. Getting those out of the ground intact must have been on the order of dealing with a T. rex skull. In addition to New Era, there were several other vendors on my list for the Pueblo show. I found the Arizona Case room not too far from New Era. Many years ago I had purchased one of their display cases and was interested in finding out if at this point a second one of the same design was possible. The salesman was very helpful and provided lots of details that will help my decision on that as well as on some of their other products. When I had been to the Pueblo years ago, I am sure that some the grounds were showing. Like the others, now there wasn’t any open space left. I have no idea where the hid the swimming pool. A large tent housed dozens of additional vendors. One of the highlights was not too far inside the door – John Dyer’s booth which had a nice assortment of faceted / fantasy cut gem eye candy. 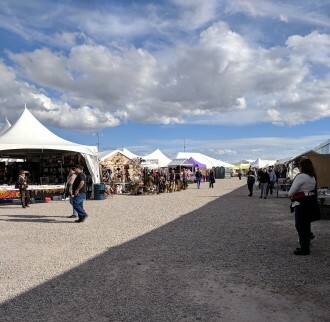 After making a quick pass through the Pueblo vendors, the next stop was the 22nd Street show across the freeway from our hotel. This was another ridiculously huge tent followed by a much smaller, nicer structure on the other side of the food court. That building housed a nice dinosaur exhibit at one end. And at the other end, one of our SLO businesses, I Love Rocks, had a nice sized booth and seemed to be busy with customers. When I finally got back to the hotel room, I discovered that I had failed when it came to note taking with respect to materials of interest back at New Era. So I headed out again to Pueblo for the last hour or so of that day’s show. On this pass, I found more vendors I had missed on my first pass. One Brazilian booth had some nice reasonably priced facet grade amethyst, citrine and aqua which might work for the sort of cutting I was planning. I ended up at the New Era rooms making some notes. I still had no idea what I would actually purchase, but the “Ultraviolet” Amethyst was screaming “take me home”. It has a vibrant color and ultraviolet just happened to be Pantone color of the year for 2018. By the time I got back to the hotel I was tired and hungry. We settled for dinner at “the Kettle” which was just steps away from the lobby door. It had been a long, fun first day.